Part I: Addicted to Mystery? Mystery is typically something that eludes our human understanding, something that can’t be explained fully. Maybe it is a bit of an enigma, getting a whiff of the forbidden fruit without getting the full taste. Mysteries fascinate and attract us: this attraction is part of the reason we have movements like science, which strive, above all, to solve mysteries just for the sake of solving them. A mystery can be as simple as a beginner-level Sudoku puzzle or it can be something as complicated as the origin of species. Regardless of the type of mystery or its simplicity-complexity, it seems to give people pleasure to investigate mysteries and to solve them. This is quite curious, because we never really want to solve all mysteries, it seems. Once we solve one, we immediately want another. It is the chase, the process of solving the mystery, that seems most attractive to people, not the actual solution. While there may be a sense of satisfaction and accomplishment in the moment when you solve your mystery, it usually comes with an unbounded yearning for the next one. Intuititevely, people in the business of selling experience know this. Video games are built on this premise – you must solve the puzzle or pass the challenge to get to the next level and the next, and so on. Once you’ve demystified all the levels, you are ready for a new game. I have this sense that if we were to solve all the mysteries in the world (let’s just pretend that’s possible), we would be left terribly bored, unstimulated, perhaps even terrified at our boredom. Religion is a source of an unsolvable mystery for many, which is really quite brilliant as far as a puzzle goes. You accept that the mystery can’t be solved (here “God works in mysterious ways” is quite apropos), but you spend your entire life trying to understand the mystery, whether it is scripture, or specific teachings, or symbolism associated with that religion. But, with religion being on the decline in the current American and Canadian climates, what other mysteries people get attached to when they do not wish to or cannot connect to a spiritual mystery? Here’s one example. 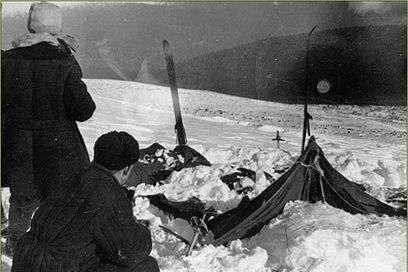 Recently I learned about a mysterious event associated with the “Dyatlov’s Pass” that took place in Ural mountains in Soviet Russia in 1959. Nine hikers were found dead under most peculiar circumstances. They had cut their tent open from the inside, and issued forth into -20C or so weather, most of them wearing little clothing and no shoes. All the hikers had internal injuries, like fractured skulls or broken ribs, yet no bruising, cuts, on contusions on their soft tissue. Some of their clothing tested positive for traces of radiation. In the snow, there were no other footprints but those of the hikers and no sign of a struggle, despite the fact that one of the hikers was missing their eyes and tongue. Other strange details abounded and the mystery was never solved. It immediately drew my attention because I am from the former Soviet Union and because...well, I confess, I love a good (murder) mystery! I began to scour the internet for clues as I did not plan to travel to Ural to try to solve this. A theory began to spin in my mind. It was exciting, interesting, and I spend much time thinking about it over the course of a few days. I don’t have an answer for this mystery. There are some sources on the internet that claim that they do, and present their theories, from aliens to avalanches. To me, I know that it does not even particularly matter what my theory is. What matters is that, most likely, this mystery will never be solved, simply due to the fact that it happened in 1959 and most of evidence collected by Soviet officials is gone or inaccessible. Not that they had complex forensics to collect evidence in the first place. What does this mean to me? That means that as I age, my mind will likely return to this mystery from time to time, ponder it, feel it out, refine my theory, and then let it go again as something I cannot solve. The beauty is that I can keep enjoying the process of “solving” it in my mind. And I am not alone. There have been many people who have been fascinated by this event, written books, produced films, spun their webs of theories. Why? It will not bring the hikers back. Now, in 2013, it will not change the lives of people living in Ural. Even if the solution presented itself, likely it would have no practical significance. Except that we could no longer ponder on the “what if?” and the “but maybe...” The process of solving mysteries is addictive in its excitement, its draw. Nothing is less exciting than something that is totally known. The excitement of presents? Usually the element the surprise and mystery more so than the present. Not to make an epistemological pun, but it seems to me that people often do not even know they are seeking mystery. So you have one example – deaths, real life deaths in the cold north of Soviet Russia, as a mystery, and people all over the world being drawn to it. But what other kinds of mysteries do we pursue? Television shows try to give us a sense of mystery, but you always must keep watching more and more, because the mystery is revealed for you, the thinking is done for you, and you do not get the excitement of building your own theory. You just have to passively watch the mystery unfold as some crudely unrealistic forensic investigators make their case. Sometimes seeking mystery can take form of possessing objects of mystery. What is the most mysterious object you possess? Perhaps it’s your phone. Do you know how it works? Do you know what enables it to communicate with others over great distances, take pictures, play videos? For most of us, the answer to that is, “no, I have no idea how it does that” (and I probably never will). So although you may not strive to solve The Mystery of the Smartphone, its magical-like qualities (i.e., it does things you want it to do, but like a lighter for a pre-fire savage, its mechanics are beyond your understanding) make you its Possessor. Being a possessor of the mysterious object may be just as exciting as being its investigator. In fact, our technological project appears to be based on a thirst for mystery (along with some other things, like competitiveness, social comparison, loneliness, etc.) We want the next mysterious object that the company promises is even more mysterious, even more magical than the one you have. Who can resist? Mystery is our idol. But, having lost the mystery of communal religion, are we looking for mysteries in the right places, or are we looking for mysteries in places where we will only get the cheap knockoff? Uncertainty is part of mystery, yet we are often terrified of uncertainty and love mystery. How can that be? Mistry and unclear elements of the continent are discussed and analyzed for the improvement for individuals. the aspiration of the visits of http://www.analyzedu.com/writing-services-reviews/rushmyessay-com-review.html are floated for the sequential and step by step plan of the individuals. Hello. To be honest, it's a very controversial information, and I'd like to hear more facts about this. Also, have you heard about bestwritingservicesreviews.com/college-paper-org/ this site? Hello. To be honest, it's a very controversial information, and I'd like to hear more facts about this. Also, have you heard about http://bestwritingservicesreviews.com/edubirdie-com/ this site? Hey guys if you want best website to get roblox for free onlline then must try http://robloxrobuxtix.com/ its gives best amazing adventures game ever.